The title sounds absurd, turkey with french toast. However, don’t discount the idea yet because we are going savory. You may recognize this as a Monte Cristo. This is one of the recipes that is quick and simple but makes lunch a little bit more tasty. If you haven’t figured it out, then Alison is the one that goes all out with her recipes. Whereas I go for big flavors with little effort. So while my recipes don’t always plate up fancy they always taste good and I get asked to make them over and over and over again. You will need bread, cheese, slices of turkey (or any protein you like), eggs, milk and butter. Essentially we are making a french toast sandwich. Only we are not going for sweet. This sandwich is brought to us by cafes everywhere. The key is to take two slices of cheese and place them on the bread. This is the magic part of the sandwich. They will melt and create the seal that holds this dish together. Then fill with a good amount of your turkey slices. You will know if you’ve gone too far because the cheese won’t be able to create a seal, but that is during cooking. Ok this is the messy part. I have learned it is best to do this one portion at a time. Crack one egg into a dish and add 2 Tablespoons of milk. Whisk together and then dip your pre-assembled sandwich into the mixture. Both sides should take about 10 seconds. The bread should soak up most of this liquid. Meanwhile melt a quarter to half tablespoon of butter in a frying pan. Coat the bottom of the pan in the butter, then pop in the sandwich over medium heat. This is where the french toast comes into play. 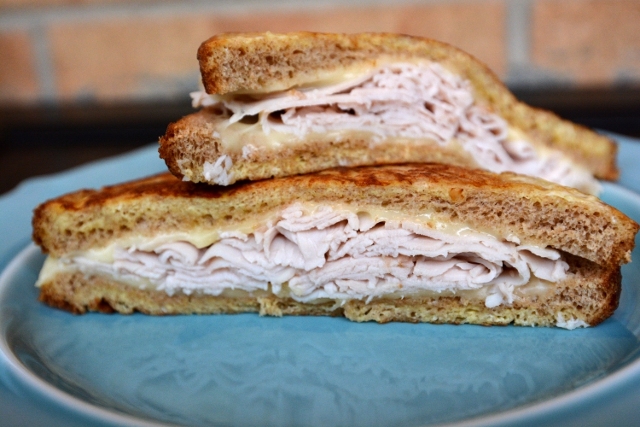 If you’ve cooked french toast before, then you can easily master this sandwich. This will not look like a toasted cheese. This will clearly look eggy, so we are going for some golden brown along with melted cheese. There should be no separation as you flip the stack. If this cuts like a deck of cards, then you need more time on the heat. I tend to slice these in half for serving. They will be more moist than you would expect. Along with the richness of all that dairy, this dish is probably going on your recipe roster. Pro tip, if you have leftover milk and egg mixture you can quickly fry it up for your furry friend.